Olivia Lane is one of my favorite twitter personalities. She always has so many creative ideas, crafts and recipes, and she's agreed to share a bit about what she does with Holistic Spaces! AC: You focus on wellness, today I wanted to talk specifically about creating a holistic home. How are some ways you help your clients do that? OL: During my 90 Day Beautiful Body, Radiant Life program I help my clients identify toxic household products and replace them with healthier ones, like replacing conventional cleaning products with natural and homemade ones. That's something that has an obvious impact on their physical wellness. That said, I love to help my clients notice the deeper connection between the health of their home and their overall wellness. How you do one thing is how you do everything. Many of us want to be healthier but it's hard to jump in Day 1 and make changes to our diet, at least ones that will stick. So why not start by making changes to our home and how we care for it? Putting more love and attention into where you live will absolutely open the door to putting more love and attention into other areas of your life. One of the first things I have my clients do is commit to having at least one meal a day seated at their dining table and using real (not paper or plastic) dining ware without TV, radio, internet or reading material. I don't care if you're eating a double cheeseburger from a fast food joint-- we'll get to that later-- but any food ingested this way is going to be so much more nourishing. 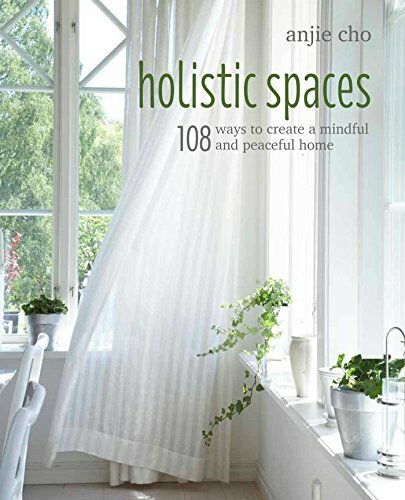 What are 3 simple tips that the readers can do to create their own holistic homes? Firstly, have friends and family over often, at least once a month. It's so important to have that love energy in there. (I find having someone over also gives me momentum to tidy up, which is an added benefit). Secondly, cook a meal at home at least once a week, even if you think you can't cook. It's healthy. It gets the creative juices flowing. It also strengthens the bond between your physical body, your soul and your home environment. Thirdly, identify how you want to feel in the world and think about how you can create that feeling in your home. For example, my core desires are to feel radiant, abundant, creative, and connected. I love keeping a bouquet of local wildflowers from the farmer's market on my kitchen counter because to me they represent those qualities. My husband and I recently moved from a house to a small one bedroom apartment (which is sort of like a studio because we use the bedroom as an office). For us, creating a holistic space was so much about simplifying. We're constantly evaluating and re-evaluating what is truly important to us, what do we want to make space for in our lives and what can we let go of. It's so important to me to be intentional about what I invite into my space. Not just with physical stuff, but with lights and noise too. I try to minimize background distraction. I don't play music unless I'm actually listening to it. I hate having the TV on unless I'm watching it, it's difficult when you live with a partner, but we're doing our best. I've also been challenging myself to use the internet less. This helps me to reduce stress and to truly focus on and enjoy the people, objects, and experiences that are meaningful to me. You're a big fan of healthy eating as well, right? Can you share one of your favorite recipes with us? How about this creative way of using leftover rice...for breakfast?! Toppings (per bowl): 1 tsp coconut oil and a few crushed walnuts. Delicious with optional fairy-dusting of brown sugar or maple syrup. If you're adverse to sugar, I bet a few slices of banana would be yummy too. Put 1/2 cup coconut milk and all the other ingredients (except the toppings) in a medium saucepan. Divide into bowls and cover with toppings. Serves two hungry people who are serious about breakfast. Can also serve up to four people who prefer a light breakfast and are somehow not concerned that lunch is 4 hours away. This could also be served cold as a rice pudding dessert. Olivia Lane is a Blogger, Green Living Educator, and Health Coach trained at The Institute for Integrative Nutrition. Olivia helps women kick sugar cravings to the curb and put out the welcome mat for a hot body, tons of energy, and unbridled joy. She empowers her clients to work with nature and their intuition to transform their health and reduce risk of diabetes, cancer, heart disease, and depression. You can learn more about her work at itsolivialane.com.